When Elizabeth Palmer’s safe, predictable life unravels, she sees it as the opportunity to realize her dream of being a writer. Even though she knows next to nothing about quarter horses, she persuades the editor of a horse breeding magazine to let her write an article on quarter horse breeder Hunter McCoy. Elizabeth does not expect the Atlanta traffic that makes her late for her appointment with McCoy, the lack of amenities in Chatham Ridge, Georgia, or the hospitality the small town offers to a stranger. She is also unprepared to see her new career end in failure before it begins, and thus she refuses to accept Hunter’s insistence that he has no interest in being interviewed. Hunter loves the land that his great-grandfather farmed and his grandfather turned into a horse ranch. The Silver Spur and the hard work required to make it once again the respected name among quarter horse owners that it was in his grandfather’s day have kept him sane during the two years since his fiancée perished in an accident. There is no room in his life for complications, and Hunter is certain that Elizabeth Palmer is a complication. He does his best to send her back to New Jersey, but she is too stubborn to give up on the interview. The attraction between Elizabeth and Hunter is strong, but Hunter’s wounds are still raw. His grief is exacerbated by a heavy load of guilt. Can Elizabeth, even with the encouragement of Hunter’s aunt, persuade him to embrace life and love? 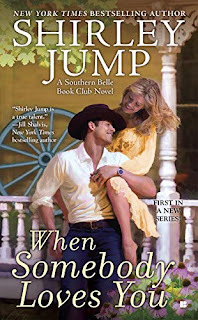 Jump introduced her Southern Belle Book Club series in the novella “Wrapped Around Your Finger” in the anthology Ask Me Why, and I liked the novella and what it promised for the world of the series. But When Somebody Loves You gave me too little of that world. I understand that the first book in a series requires a fine balance between setting up the series with sufficient world building and development of secondary characters and focusing on the primary romance. Often authors slight the romance in favor of creating the world. Jump does the opposite. Unfortunately, I had problems with the romance too. Elizabeth and Hunter are likeable characters. Elizabeth is a gutsy heroine, and Hunter’s ranch and his love for it were the best parts of the novel. I found it easy to hope the H/H would both find happiness. However, I never fully bought into their love for one another. Lust is undeniably strong, but I just never saw the kind of connection that allowed me to believe in an HEA. Overall, this is not a bad book, but it is one that promises more than it delivers. I still like the premise, and so I’ll suspend judgment on the series until I read at least one more book.